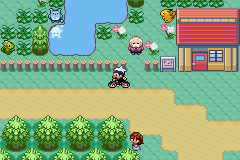 When you arrive in Mauville City, the first thing you'll want to do is to get yourself a free Bike. 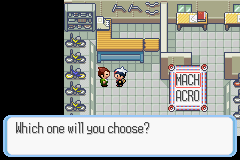 Go into the house to the right of the Pokemon Center, and you'll get one there by talking to the person shown in the screen shot. There are two bikes, Mach and Acro. Choose what you like after listening to the following explanation. The Mach Bike is good for speed, while the Acro Bike can do a lot of tricks. To learn more about them, read their manual at the top of the screen. With a Bike, you'll be able to move so much faster, although the Running Shoes are already quite fast. If you ever want to switch Bikes, come back to talk to him. With your new Bike, you can now go cycling on the Seaside Cycling Road. Also, the person in the house to the right of the Mart will give you an essential item, HM06 - Rock Smash. Teach it to one of your Pokemon, although you can't use it until after you get your third badge. Mauville City has a Game Corner to play slot machines, but you'll need to get a Coin Case. Make sure you get a Harbor Mail, and talk to the girl in the house near the Game Corner. She'll give you the Coin Case for the Harbor Mail. Now you can go into the Game Corner to bet! The slot machines are quite exciting. You can either insert one, two, or three coins. You get coins for matching three of the same kind either horizontally, diagonally, or both. There are two roulette tables here: one with the minimum wager of one coin, and the other, three coins. On both screens, you'll be shown a screen with a four times three box. Each row has four Pokemon (Wynaut, Azurill, Skitty, and Makuhita) with three colors (orange, green, and purple). Betting on a single box will give you 12X the bet amount, a whole row would give you 3X the bet amount, and a vetical line will give you 4X the bet amount. Mauville Gym: Shocking, Isn't It? The Mauville Gym has two people in front of it, one of them who's blocking the entrance. He's Wally, and he wants to battle you. He's horribly weak as he has only one lv. 16 Pokemon. 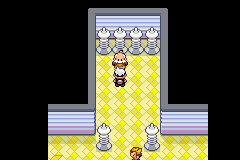 After beating the him, the two go away, and you're free to enter the gym! This is an electric gym, so be prepared with some anti-electric Pokemon. There are four trainers waiting to shock you, but show them that a little shock can't hurt a humble Pokemon Trainer like you. The electricity wall is nothing to worry about. Simply step on the lightning bolts, and the walls will move to different places to let you through. Wattson is the gym leader here. He has a lv. 22 Magnemite, which is part Electric and part Steel type. He also has a lv. 20 Voltorb, and a lv. 23 Magneton. The Magneton is the strongest Pokemon on the old man's team. In Emerald, Wattson has an extra lv. 22 Electrike, a lv. 22 Magneton instead, and a lv. 24 Manectric as his strongest Pokemon. For winning, you get the Dynamo Badge and TM34 - Shock Wave. The badge gives you the ability to use Rock Smash outside of battle, and will raise the Speed of your Pokemon. After getting what you came here for, you can head west onto Route 117. At the very beginning of Route 117, there's a Daycare Center. If you wish, you may go into the center and leave up to two Pokemon with the old lady. By leaving your Pokemon there, they'll raise levels automatically. The lower the level of the Pokemon, the faster the levels will gain. As the Pokemon gain levels, it is possible that a new move will be learned and an old move will be erased. Of course, money is involved. Whenever you want to pick up your Pokemon, the old lady charges $100 for each level gained. After leaving a Pokemon in the Daycare Center, you can go on. Route 117 is pretty straight forward and short; just keep going west. Most of the people here are pacing around. On this route, you can have a two-on-two battle with two girls standing near the Berry trees. Real soon, you'll arrive in Verdanturf Town.